We are going to address some of the most common questions that we get asked here at Lottoland. Hopefully, these answers will help you to understand a little bit more about how our company works, and ease any concerns you may have. No Lottoland is not a scam! Lottoland holds a United Kingdom gambling license and is subject to the same rules and regulations as any major UK gambling company. Any money which you win at Lottoland is guaranteed to be paid out in full to verified accounts. Our license is fully reliant on our ability to pay out our customers’ winnings, swiftly and reliably, while remaining fully transparent with regards to our operations and financials. We must maintain the highest of standards in order to be able to keep our licence, and that includes paying out on any jackpot wins, no matter how big they are. You can bet on any of these lotteries legally at Lottoland because you are not 'playing the lottery' but rather betting on the results. In order to buy an official lotto ticket, you must be present in the country where it's run. In many cases, such as the US lotteries, you must also be an official resident in order to collect winnings. 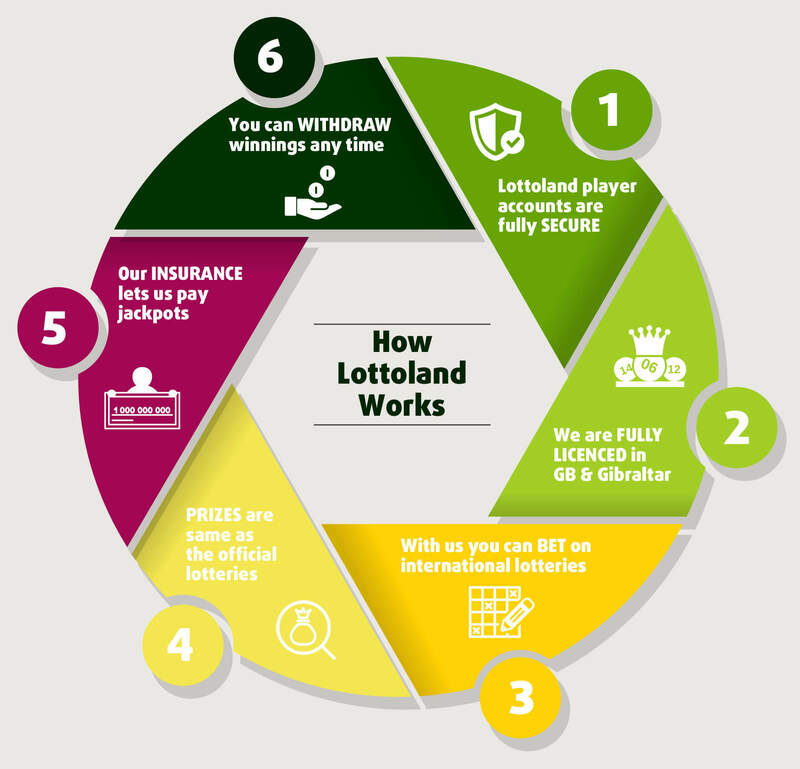 Betting on the results with Lottoland provides an alternative way for UK Lottolanders to participate and means you can win the same amount as the official jackpots. Plus we also have EuroJackpot, the other big European lottery, which is still relatively unknown here but every bit as famous in Germany and Scandinavia. We also offer the massive Spanish Christmas Lottery, better known as "El Gordo" plus the the two American giants MegaMillions and jackpot world-record holder, PowerBall. At Lottoland you win the same amount of money as you would if you bought an official lottery ticket. For American lotteries like Mega Millions and Powerball this means that you get your winnings paid out as an annuity over 30 years and less the 35% you would pay in state and federal taxes (as state taxes on gambling vary from state to state this is an average). So while you do not pay any taxes, the winning amount you receive will be the same amount as a US-based winner would receive after tax was deducted from their winnings.